Appointed by the Mayor and Council, the City Clerk is the official record keeper for the City. Duties include recording and maintaining the Council’s official actions in the minutes, coordinating and distributing the agendas, maintaining contracts, ordinances, resolutions and agreements for the City, attesting signatures of the Mayor and Council, and keeping the City Seal. The City Clerk oversees the adoptions and publishing of the Code of Ordinances and helps to ensure that all open record requests are in accordance to the Open Records Act. Ball Ground’s City Clerk is Karen L. Jordan. The City of Ball Ground hired Mrs. Jordan July 1, 1985. In 1993 she earned her Certified Municipal Clerk designation. Mrs. Jordan is a member of the Georgia Municipal Clerks and Finance Officers Association and the International Institute of Municipal Clerks. In 2006 Karen was selected by her peers as the “State of Georgia Clerk of the Year”. 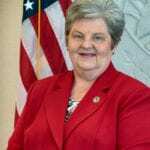 In 2018 Karen was elected to serve a one year term as President of the Georgia Municipal Clerks and Finance Officers Association. Karen is also a member of the Cherokee County Chamber of Commerce and a graduate of Leadership Cherokee. The City Clerk also serves as the Superintendent of Elections for all City Elections.